Uhh....this was a fabulous find...and a delicious meal in a jar, perfect for the weather FINALLY shuffling in some cool breezes that hint at fall...These were also super easy to put together. I originally saw the idea for this at Giversblog. 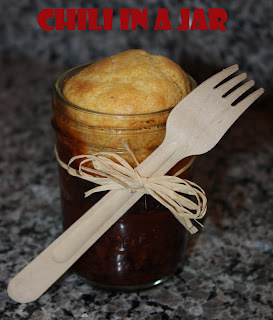 I love everything jar related....I used a packet to let chili cook in the crockpot all day (on low) based on the package directions. When I got home, I filled mason jars about halfway with chili. I then used a cornbread package and mixed up the meal according to the instructions on the package. I pour the wet ingredients over the chili and placed these on a pan in the oven (makes about 6). I baked it at the degrees and time the cornbread called for. Dig in. Eat up. I'm using this for football get togethers, everything you need in one jar that is portable! You must...must...must try this strawberry cake recipe. Shirley, who provided a delicious broccoli salad recipe a few months ago shared this one with me as well. Just like I place the bacon/mayo covered broccoli under the 'vegetable' category, I'll be calling these a fruit when I mark it down in my calorie counter. These would be really cute decorated like actual strawberries, but I was working with little energy and little time when I put these together, but I did use a few of the 420 vegetable baskets I bought....need...intervention...now. Cupcake Instructions: combine cake and gelatin mix. Make a well in the center and pour 1 c. of berries, oil, milk, and eggs. Beat until well blended (about three minutes). Fold in coconut and pecans. This makes a very full 24 cupcakes. Bake 18 minutes, or until toothpick comes out clean. I used this strawberry icing recipe with this recipe. These cheddar crackers taste a lot like the 'crack' they disguise in boxes with names like 'Cheez It's.' They just taste fresher, and softer. You can roll 'em thin and make them crispier, but a little thicker and it's a cracker/bread that fits in you hand, and on your hips rather nicely. I found the recipe here at Montana Homecooking. I'd say they were delicious and they can't be missed, but I'm worried I'd convince myself to go make ANOTHER batch. I am, however, saving this recipe because it was great, and I'll make it again someday. 1. Place the flour, salt and pepper in a food processor, then add butter and pulse until the mixture resembles coarse meal. Add grated cheese a little at a time until the mixture again looks like coarse meal. 2. Pulse in 3 to 4 tablespoons of water, one tablespoon at a time, until the dough forms into a ball. It will take a minute or so. 3. Remove from processor, wrap in plastic, and chill anywhere from 20 minutes to 24 hours. Roll the dough out to 1/8th-inch thickness directly on a baking sheet. You don't want to roll them paper thin, neither do you want to roll them too thick. If they are too thin, they will not puff up as much. If they are too thick, they will not be as crispy. You've all read the three little bears, be Goldilocks. Using a knife or pizza cutter, cut 1 inch squares, you can also use small cookie cutters to make shapes. Bake at 350° F for 15-20 minutes or until crackers are golden brown. Begin watching these about 10 minutes in, mine took 15 minutes. I'm not really a witch hat kind of gal, but I saw a headband like this last year in New Orleans, and I decided to see what I could rig up. I love these little mini hats on a band, and I've seen them all around. I found this sequined headband last year at the after Halloween sales, and I bought some glittery felt at Hobby Lobby. I cut out a base and a cone shape. I glued the cone shut, and then stitched it (you could also glue it) to the base. I added some feathers and rhinestones I had sitting around. I added a little black circle flower. The original had a blue spider web painted on the side, but this was festive enough for me. I glued it to the band, and then added a strip of felt over the headband and attached to the bottom of the hat to double secure it. This is the kind of thing I'd wear for Halloween. I'm not really into major dressing up....fine....witches aren't my thing either, so I'll be passing this out, but I have now entered the world of tiny hats.....and I can't wait to delve deeper! I love everything Hostess Cupcake. I've made homemade Hostess Cupcakes before, which I blogged about here. I've made cake ball Hostess Cupcakes...which I blogged about here. 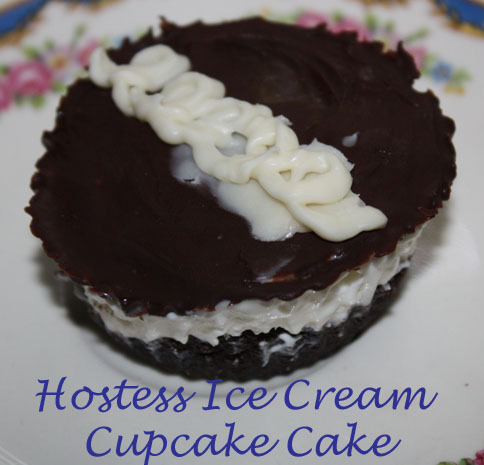 Now....Ice Cream Hostess Cupcakes. I saw this idea for Marshmallow Ice Cream, and I knew this would be the perfect home for this creation. Instructions: In a pan, combine half and half with marshmallows. Cook over med. heat, stirring constantly until marshmallows have completely melted. Remove from heat and let cool for a few minutes. Place in fridge for 20-30 more minutes, until chilled and slightly thickened. While mix is cooling down, whip heavy cream until you have soft peaks. Fold into cool marshmallow mix and add vanilla. Stir until everything is combined. Place in ice cream maker and follow machine's directions for making ice cream. This is a very light ice cream, but it went well in between these rich layers. After my ice cream was ready I accembled my cakes. I baked chocolate cupcakes, not filling the liners full. Once they were chilled, I squished it all down into the bottom to make it an even thicker base. I used a plastic molded cupcake liner. I added some ice cream. Then I melted chocolate (at 30 second intervals). I poured this on top of the whole thing. I piped on the traditional swirls with white chocolate. This makes about 24 cupcakes. Awhile ago I went to a craft store and saw baby towels rolled and placed in a coffee filter. I recently attended a Sip and See, and I decided to bring onsies, and apply this same concept. I brought a blanket that looked like a big lollipop a few months ago (here), and it was a big hit, so I figured food shaped gifts would go over well. They did. I bought 4 onsies, and two pairs of pants. The pants were a little thick, but they turned out cute. I folded each into narrow strips. I rolled them up tightly, and then added a rubber band to hold them in this shape. I placed each in cupcake liners to cover the bands. Six cupcakes later, I had a little gift to tie up and bring to the party. I needed a dessert for a dinner awhile back that would be easy to grab b/c it was a stand and eat kind of deal. I decided to try out this recipe, and adapt it to a cupcake liner. I found the recipe in this book my buddy Regan gave me, it was a fundraiser for her husband's troops. I loooove recipe books, especially with a story. I added just enough batter to cover the cookie to each cup. I took store bought cookie dough and made 1/2 inch balls. Pressed two into the cups (press them down, or they will pop up and get really crusty). Cover the tops with the rest of the cheesecake batter. Fill them almost to the top. They will puff up while they are cooking, but sink back down afterwards. Add whipped cream and chocolate chips to the top if you've given up on diets all together. Otherwise, forget I ever said anything. These were actually really good, and they peels right off of the cupcake liners. I'm attaching the recipe below, but tfour things I adapted-instead of the crust (crushed oreos and butter) I just used the base of a cookie, I didn't need the pan (obviously), the liners worked well. I also halved the cream cheese batter (the full recipe is below), and it still made 16 cupcakes. Last, I reduced the baking time to about 45 minutes. Ingredients: 2 T. margarine, 2 1/2 c. chocolate cookie crumbs, 2 lb. cream cheese (softened), 1 c. sugar, 4 eggs, 1 t. flour, 1 t. vanilla, 1 c. sour cream, 1 pkg chocolate chip cookie dough (from the fridge section), 1 c. chocolate chips. Instructions: Preheat oven to 325. Crease bottom and sides of a 10 inch spring foam pan well. Combine cookie crumbs and butter and press into the bottom of the pand and up the sides. Combine cream cheese, sugar, eggs, and flour. mix with an electric mixer on high until smooth. Add vanilla and sour cream, mix until just blended, and then fold in chips. Pour 1/2 of the batter into the pan. Cut cookie dough into golf ball sized chunks, and drop into batter. Pour remaining batter over dough. Bake 60 minutes. Turn oven off, open oven and allow it to remain in the oven an additional 30 minutes. Cool and refridgerate. With a degree in rocket science, you too can make spaghetti cupcakes. Fine, it's not going to change anyone's life, but how fun are :insert anything on earth: served in cupcake form? These hold together well, and per the nature of spaghetti are better the next day. As for the innards. I just mixed a pound of cooked meat with a jar of spaghetti sauce and a few spices and garlic . I added my noodles (any would work, just cook up a box, add and drain), and then filled cups 3/4 full with this mix. (I tried half out with some crust, but the crust was just soggy, so do as I say...not as I did). Half were just noodles...you can see one of those in the top left hand corner. Add a handful of mozzarella cheese on top and a sprinkle of Parmesan. This becomes the glue. Bake at 350 until the cheese is melted. Let these cool enough before popping them out so they retain their shape. Baked spaghetti is just good anyway, but baking them in cups provides fuel for my cheese to noodle ratio needs. This make approximately 2,00,345 cupcakes. There aren't a lot of things I love as much as a sugar filled cupcake, but these are equal to any cupcake I've ever shoveled down....I mean....nibbled on like a delicate flower. These are worth every minute...and calorie. I found this recipe at Farm Girl, she doesn't know it yet, but she's pretty much one of my favorite people today. Dough Instructions: Combine yeast, sugar, water, and stir. Let sit until bubbly. Add salt, oil, yolk and mix. Add 3 c. of flour and mix. Add 1 more cup, mix. Add up to 1 1/2 cup more until dough is barely sticky to fingers (I only need 4 1/2 c.) Knead 2-3 minutes. Cover and let rise 1 hour. Roll dough out onto a board sprayed with cooking oil (like Pam). Mix butter and garlic salt, and spread over the rolled dough. Roll up (like you are making cinnamon rolls). Slice into 18 pieces. Let these rise for 20 more minutes while the oven is heating. If garlic cheese cupcakes were a boy....I'd marry it yesterday.